BRITAIN'S FORGOTTEN SLAVE OWNERS is a series of two one-hour documentaries that will be shown on the BBC. 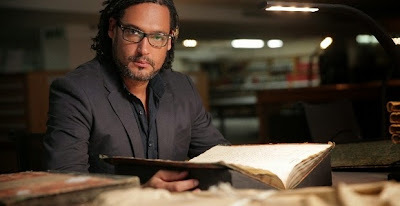 It is based on some pioneering research done at University College London that does micro research on the archive ledgers showing who was compensated for the abolition of slavery in 1830s Britain. The tragedy is that, of course, it wasn't the slaves or their descendants who benefited from a government handout worth £17bn in today's money, but the slave owners themselves. As might have been expected, the documentary shows is that here are many large scale slaveowners whose rapid financial success was soon transformed into entry into Britain's elite. In an admirably balanced interview with the 8th Earl of Harewood, the presenter David Olusoga sees the palatial wealth that slave-owning brought to the man who is now fifty-something'th in line to the throne. But what is far more surprising is just how widespread slave ownership was in nineteenth century England, with the middle classes owning perhaps just a handful of slaves, some through inheritance, all bringing in a modest income and thereafter compensation. In other words, slavery wasn't just the tool of the oligarchs but a systemic and endemic system that created the wealth that founded Britain's industrial revolution. The first episode of the documentary shown at Sheffield was insightful, moving but scrupulously fair. It's a tough watch in parts - and that's only right. But what's interesting is that it isn't just seeing instruments of torture that's tough. It's realising how complex the issue is, in the example of a mixed-race child who inherited his father's estate, was sent to England and became in all senses a gentleman. He never went back and didn't free all his slaves, despite having been born into that condition. This is a fantastic example of the complex and often contradictory English political and class system, that could see a mixed race man lauded for his wealth and education and according is rights in the seat of the Empire, but transformed into mere property if were to return to the Caribbean. I can't wait to see the second part of this documentary that is more focussed on the economic impact of the compensation paid to the slave-owners and how its impact fed into every aspect of the British economy that we live with today. BRITAIN'S FORGOTTEN SLAVE OWNERS has a running time of 58 minutes.